no other technology has been adapted for similar low-head dam utilization. What is a "low-head" dam? How many low-head dams exisit? There are over 72,000 low-head dams across the United States. These were primarily constructed prior to 1950 on non-commercially navigable rivers to provide flood control and a reliable source of water for adjacent industries. There is very little standardization in the design of the dam structures. Most are operated and maintained by local government agencies or the Army Corp of Engineers. Do they have any safety issues? The water turbulence on the downstream side of the dam is considered extremely dangerous and inhibits recreational use of the river. Mr. Fred E. Williams, Jr. was awarded a patent in 1999 for a device that addressed the ability to capture the power provided by the flow of water over the weir of a low-head dam. A second patent was awarded in 2005 related to the turbine housing, and a third patent is pending at this time to incorporate further design improvements. An experienced, results focused, economic development and regional planning professional committed to leveraging the assets of the community in creative and innovative ways. As a Business Development Specialist with the City of Hamilton – the second largest urban community in Greater Cincinnati – Mr. Seppi is dedicated to continuing the region’s legacy of manufacturing and entrepreneurship. His background is primarily in information technology, directly marketing enterprise software solutions to sectors that include automotive, education, financial, and Fortune 500 industries. Mr. Seppi provides a unique blend of community and regional planning, business development, and marketing expertise. He is dedicated to an innovative, non-traditional approach to economic development that emphasizes small business ecosystem development, quality of life issues, and historical preservation as a means to attracting investment and opportunity to a community. 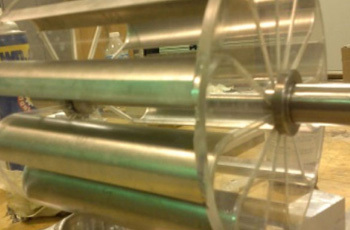 Among his many other responsibilities as Dean, Dr. Sritharan has led the efforts to develop and test the Williams Cross-Flow Turbine at Central State University’s McLin International Center for Water Resource Management. His leadership oversaw the construction of test facilities in the University’s laboratory utilizing funding provided through a grant from the Electric Power Research Institute. Under his direction, laboratory testing that confirmed the performance and scalability of the design was conducted and published. Mr. VanDrake brings a progressive and creative approach to the development of intellectual property and business strategy for emerging businesses and start-up companies. His clients are predominantly start-up firms and venture-backed companies. He helps develop comprehensive strategies in a broad range of technologies including software, medical devices, and mechanical and electrical innovations assisting clients with patent drafting and prosecution, trademark registration and clearance, and copyright and trade secret protection. His experience includes providing clients with patentability, validity, and infringement opinions, and serving various intellectual property litigation and regulatory (FDA) needs. Mr. VanDrake has worked in-house for a Fortune 500 company, has co-founded three start-up companies, and has helped two of his companies go public. Vance is the President of the Greater Cincinnati Venture Association, was appointed by the Mayor of Cincinnati to the Small Business Advisory Committee, and was recognized as one of Cincinnati’s “Top 40 under 40” by the Cincinnati Business Courier. organization, and attended the University of Virginia and Harvard. Mr. Chaney currently oversees environmental studies for transportation, electric and gas transmission, power plants, gas and oil wells and renewable energy sources such as wind farms. He previously held the position of Vice President and Director Natural Resource Management at BHE Environmental, Inc. and was Assistant Vice-President at GAI Consulting. He holds an undergraduate degree from Eastern Kentucky University and a Masters in Business Administration. Mr. Abramson has held several leadership positions in at Duke Energy. With over 30 years of experience in the electric utility industry, he has been involved with many types of energy generation including, wind, solar, hydro, geothermal, and traditional thermal generation. He has been a presenter at several national conferences and has written for Power Engineering Magazine based on his work on condition monitoring equipment. He has also co-author a white paper on Low Head-Hydro and has been involved in research on this topic for several years. Mr. Abramson holds a Masters of Business Administration degree, with undergraduate studies in engineering and business.